MEET ME IN ST. LOUIS (1944) was a landmark among movie musicals. First, it was a period piece set in the American Midwest at the turn of the century. Second, its plot didn't revolve around Broadway or show business or show people, concentrating instead on a typical upper-middle class family. And third, the songs and dances were so well integrated into the plot of the film--yes, a musical with a plot--that they actually advanced the storyline and revealed the personalities of the characters. The characters sang and danced because they felt like it, not because the script called for it, and the atmosphere this creates for the story is beyond anything seen in a musical before. Credit for MEET ME IN ST. LOUIS's achievements is all-encompassing. It features a memorable cast, from the vocal talents of Judy Garland to the veteran caricatures of Harry Davenport, Marjorie Main, Chill Wills, Mary Astor and Leon Ames, and the memorable performances of youngsters Margaret O'Brien and Joan Carroll. Irving Breecher and Fred F. Finklehoffe adapted a marvelous screenplay from Sally Benson's autobiographical Kensington Stories. Ralph Blane and Hugh Martin contributed a number of wonderful tunes, Irene Sharaff took full advantage of the setting in designing her period costumes, and George Folsey earned an Oscar nomination for his Technicolor cinematography. And overseeing it all, director Vincente Minnelli and veteran MGM musical producer Arthur Freed succeeded in pulling everything together to create a nostalgic piece of Americana that continues to transcend the years. The year is 1903 and St. Louis teenager Esther Smith (Judy Garland) develops a crush on "The Boy Next Door," John Truett (Tom Drake), who just moved into town. The complication is that although she lives at 5135 Kensington Ave. and he lives at 5133, they've never met. So Esther and her older sister Rose (Lucille Bremer) throw a going-away party for their brother Lon (who is off to Princeton) as an excuse to invite John over. And quite a lively party it is. 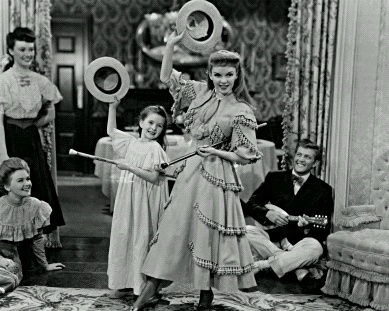 Esther's youngest sister Tootie (Margaret O'Brien) even sneaks downstairs and gets to join the fun, singing "Under the Bamboo Tree" and dancing a cakewalk with Esther, delighting their guests. 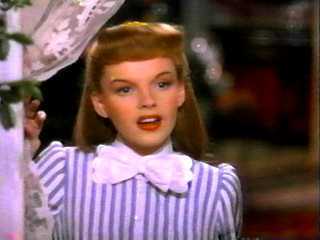 "Under the Bamboo Tree" (clip) sung by Judy Garland and Margaret O'Brien (a .MP3 file courtesy Rhino Records). "Personally, I wouldn't marry a man who proposed to me over an invention." --Katie. "My dear, when you get to be my age you'll find there are more important things in life than boys." --Rose. "Mrs. Smith, if I have to keep lying for your girls, I'm going to need more money." --Katie. "Wasn't I lucky to be born in my favorite city?" --Tootie. "Personally, I think I have too much bloom." --Esther. "That Welsh rarebit was ginger peachy." --John. "Well, certainly is dark in here with the lights off." --Esther. "No, it wasn't the street car. It was John Truett. He tried to kill me!" --Tootie. "It's no worse than football practice, except it's better with a girl." --John. "If you're not busy tomorrow night, would you beat me up again?" --John. "You know, you've got a mighty strong grip for a boy." --Esther. "It'll take me at least a week to dig up all my dolls in the cemetery." --Tootie. "I've worked all my life to be a senior." --Esther. "Money. I hate, loathe, despise and abominate money!" --Rose. "Aren't you afraid to stay here alone with a criminal?" --Mr. Smith. "You know, suits are like men. They like to step out every once in a while with a pretty dress." --Grandpa. When the party is over, John stays behind to help Esther put out the lights, and as the gas light dims, John and Esther spark "Over the Banister."